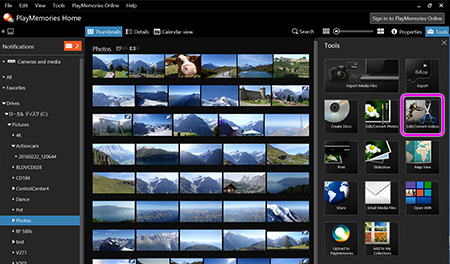 "PlayMemories Home" is loaded with many different functions for editing videos. 1. In Calendar View or Folder View, select the video that you want to edit. 2. 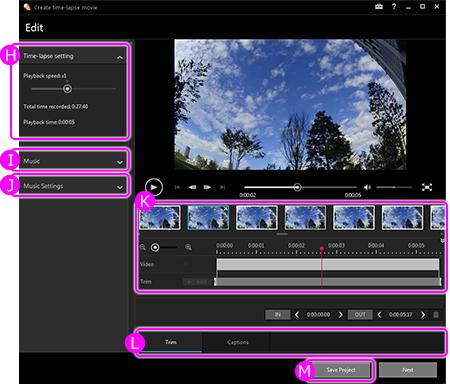 Click [ Tools] - [Edit/Convert Videos], and then select your desired edit function. 4. When you finish editing, save the video. You can insert text, sound and apply other editing operations. 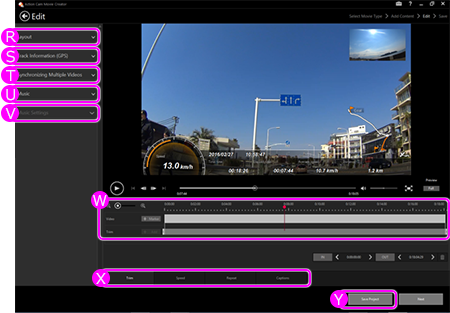 You can also edit the speed of videos recorded in high frame rates. The content selected for editing is displayed. To add the content, drag & drop from here to the timeline. Adjust the volume of the video and music. For videos that contain marker information, they will be displayed at the upper section of the timeline. When applying an effect to a video, control the settings at the lower section of the timeline. 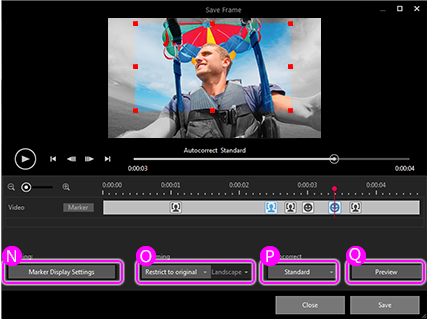 For videos recorded in slow motion, you can edit the selected areas to be in its original speed by opening the [Speed] tab and selecting the [Actual speed] speed effect. Display multiple still images and create a single video. Thumbnails of the photos to combine will appear. Photos are combined from left to right.For videos that contain markers, they will be displayed at the upper section of the timeline. You can cut out only the required video parts, and save them as new files. You can combine multiple videos recorded with your camera. - Only videos recorded in the AVCHD, MPEG-2 or MP4 format can be combined. - Videos in the same format can be combined. - You cannot combine MP4 format videos, if their codecs, sizes, frame rates, or bit rates are different. You can capture photos of your favorite scene in a video. For videos that contain markers, you can select the markers to be displayed. You can see a preview of the photo that is cut-out. You can make a new video by locating up to 4 different MP4 format videos taken at the same time, on 1 screen. 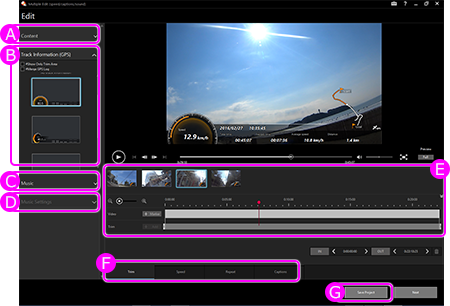 When using an action camcorder equipped with the GPS recording function, you can also embed the map view on the videos. Press the "Details" button to make any of the following setting adjustments. For videos that contain markers, they will be displayed at the upper section of the timeline. A maximum of 100 markers items can be recorded for a single video recording. You can save material being edited as a Project file. By using Project files, you can continue editing a project in progress. Project files of videos with Action Cam Movie Creator "movie credits" cannot be displayed in PlayMemories Home. Please use Action Cam Movie Creator to display such Project files. SSE-TN1S and Smart Tennis Sensor App are available only in those countries. Austria, France, Germany, Ireland, Italy, Spain, Switzerland, UK, USA, Canada, Japan, Australia, New Zealand.